Members of the Spirit in Action team attended the Free Minds, Free People Conference held in Chicago earlier this month. We conducted interviews with key individuals in the education justice movement as part of our recently launched Education Justice Listening Project. We interviewed individuals from Save our Schools, Alliance for Educational Justice, Education for Liberation Network, Chicago Teachers Union and many others. Our primary goal at this stage of the project is to interview a wide range of people working for education justice to learn what is happening on the ground to get a sense of their vision for education. We will then facilitate a space with two of our networks the Education Circle of Change and the Progressive Communicators Network in late 2013 to look over the results of the listening project, and to develop an action plan to serve as a communications resource for 2014 to 2017. By early 2014 we’ll share highlights of the communications victories and assets that grassroots groups across the country have developed to advance education reform. We’ll propose a communications project in which education justice groups that take part in order to develop their leaders as communicators and to use compelling and consistent messaging for their education justice work. In the video above, Qasim A. Davis from Kids Rethink New Orleans Schools, a long time partner of Spirit in Action, shares a short clip about the state of our public education system. Take a look at the video and let us know what you think, do you agree with him or do you share a different opinion? We would love to know your thoughts add your comments below. Additionally, we will soon be headed to the International Democratic Education Conference (IDEC) in Boulder Colorado, August 4-8, to continue our listening project and we look forward to sharing more powerful voices and perspectives with you. If you will be there please let us know and connect with us. Now more than ever, we need women of color who are on the frontlines of social justice movements to build community and power to transforms ourselves, our communities and our world. In the midst of powerful voices reverberating across the country, many of who are women of color calling for Justice for Trayvon Martin, I feel honored and privileged to create a space for these sisters to reflect, heal, vision and transform. The core leadership committee of SiOP invites women of color leaders, across generations, who are committed to creating a more just, equitable and sustainable world to apply to be part of the 2013-2014 SiOP Transformative Leadership Institute. The 10-month program kicks off with a national gathering at Hope Springs Institute in Ohio, October 2-6, 2013, and is followed by coaching, trainings and peer mentorship. Take a look at the call for applications, where you’ll also find a link to the online application. Please note that applications are due on August 12. This unique leadership development program is focused on supporting women of color, who stand at the intersection of multiple oppressions, to address both internal and external oppression to shift the paradigm of leadership in social justice movements and beyond. The SiOP network seeks to collectively create and embody new practices for leading powerful and sustainable social movements that are working for racial justice, gender justice, economic justice and environmental justice. In a recent article on World Pulse, SiOP core leader, Dayanara Marte, reflects on being a mother in this moment working for justice: “My son, more than any other day, today, I write you not as your mother but as a women who birthed a son into this unjust world without a road map. I am lost and I am scared for you and for me. They say that women birth justice…They say women are magical, made with the infinite ability to manifest and transform the world but today I am scared and I doubt my own ability to create another world for you.” Read more from Dayanara. Women indeed have the power to birth a new world. And, at this critical time, we are faced with many choices. There are two paths before us, we can isolate ourselves and live in fear or we can stand in our power, build community and spark transformation. The SiOP Transformative Leadership Institute will support women of color to live into the latter and to work through our fears and a dominant narrative that tells us we must play small. Our time is now, and we must start with developing our selves, our vision, our resilience and our power to take action for deep and lasting change. From October 2013 to July 2014, thirty women will come together to living into this vision and strengthen our leadership to build the world we envision, a world that works for all of us. 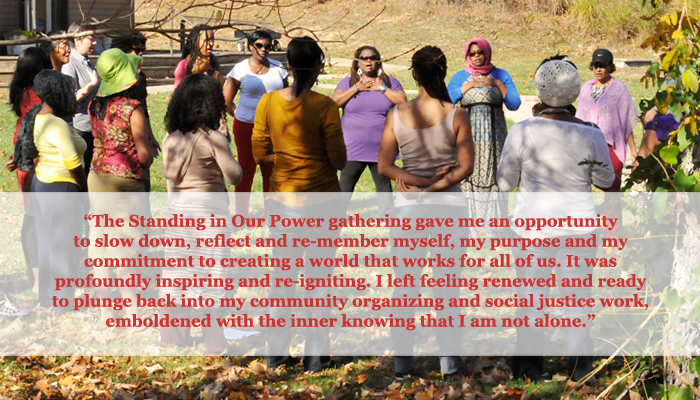 If you are a woman of color leader working to creating a just, equitable and sustainable world, and would like to further develop your leadership within a supportive community, please consider applying to be part of the Standing in Our Power (SiOP) 2013-2014 Transformative Leadership Institute. Get the details and apply today and/or spread the word. I just wrote my new 15 year vision. I had created a 13 year vision back in 2007 for the year 2020. But, now I need a new one because almost everything in that vision has been accomplished. My new vision begins with “it is July 2028 and I am 75 years old.” I went on to say what I was doing currently, what I had accomplished in the past 15 years and how I was doing it. I am excited to begin this next journey by reflecting on my accomplishments, and with a renewed vision in partnership with my Spirit in Action team. I want to share a story of visioning with a group I’ve been involved with since spring of 2006. The most exciting thing about this work is that it has been with young people. This month, at a national education conference, several young adult leaders came running up and hugging me. Only after looking at their name tags did I recognize them from the young people I had lead visioning with back in 2006. 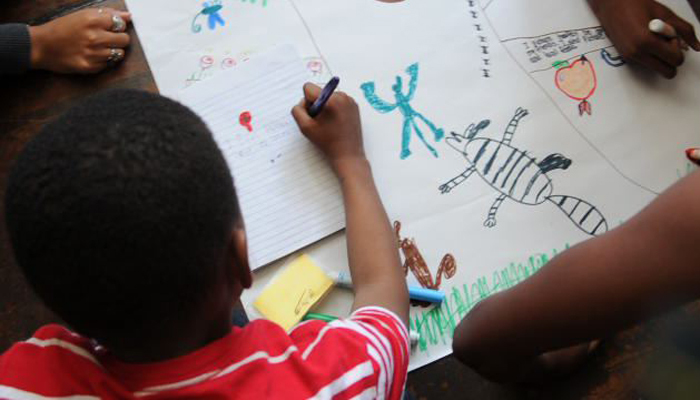 The first year working with Kids Rethinking New Orleans Schools — the summer after Katrina — we began with a vision of the schools and world they wanted to create 25 years into the future. One of the young boys said “this is only just pretend!” I agreed. It was just pretend, unless we created a roadmap and action plan to get there. Now, that young man is one of the leaders working with the current group of “Rethinkers” in developing this year’s curriculum and co-leading the 6 week program this summer. The dreams the young people had that first year, and subsequent years have been astounding. They have had victories around every annual visioning project they have done. Last year they made a video about visioning and the impact it has had on their work. Has their collective visioning worked? They have had multiple victories. One such victory around changing the cafeteria food policies in their schools is shown in an Emmy nominated HBO documentary called “Weight of the Nation: The Great Cafeteria Takeover” starring the Rethink students. They were able to take on Aramark, a multi-national corporation that serves cafeteria food to two and one half million children across the United States and the Rethinkers succeeded! They have not won everything they want, at least not yet, but they now have their foot in the door and are holding these powerful people accountable to what they promised. What does all this have to do with cultural shift? First, the idea of beginning with a collective vision – focusing on what we want to create rather than what we are against – is the most important step in creating real, successful, and sustainable change. Second, strong voices and accountability can make change – even with large multi-national corporations. Three, sitting in circle and building relationships are a critical part of developing trust, hearing each other and creating change. Four, taking action on the vision we create leads to victories. Five, giving young people the knowledge and empowering them to speak for themselves create our leaders of the present, as well as for the future. So, visioning has everything to do with creating cultural shift. Starting with vision provides us a positive grounding to work from. It supports us to look for solutions and ways to get there. It also inspires ourselves and others to keep motivated toward that vision even during times where we feel hopeless and ready to give up. In a society where we’ve grown up focusing on the problems and what’s wrong, shifting to a positive vision approach can be challenging at first, but once you have participated in this process, you will never want to go back. It builds trust, collective power, hope, and joy. It sets us on a path toward winning on the issues we are working on. Collective Visioning helps us create a different culture in the way we do our work that is sustainable, supportive, and achievable. To learn more about how to lead a collective vision process within your own group or organization, go to http://spiritinaction.net/toolkit/ to download a free copy of Occupy the Present, Change the Future: A Collective Visioning Guide, or if you prefer a full understanding of how to set up diverse groups, prepare and lead collective visioning with exercises and examples, order a copy Collective Visioning: How Groups Can Work Together for a Just and Sustainable Future. Feel free to use the comment section below for any questions or ideas you have (we would especially like to hear your thoughts if you have participated in collective visioning in the past). We would love to hear from you and will respond.